Carlos Dotson had a great RS Freshman season at D2 Anderson University. The 6’8 270 lefty post player averaged 10.9 points per game and 8.1 rebounds per game while shooting 56.5% from the field. These numbers are impressive for any player coming off a Medical Redshirt. Dotson only played in a few games in the 15-16 season due to a nagging ankle injury. After rest and rehab, Dotson felt 100% on the court and it showed. 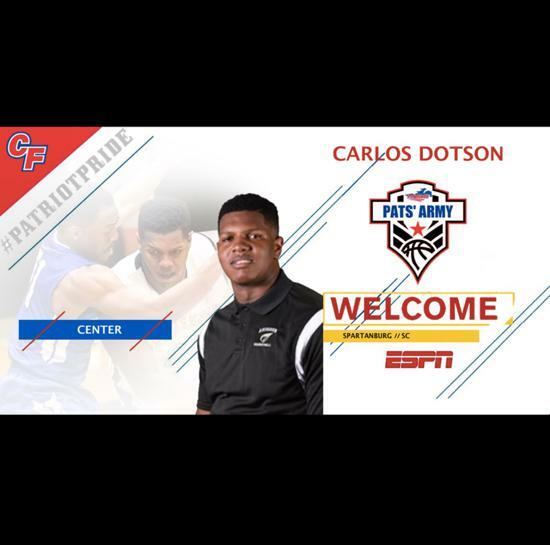 Dotson recently transferred from Anderson University and has signed with the College of Central Florida for the 2017-2018 season. He had several Division 1 schools contact him once they heard he was transferring. Rather than sit out a year at a D1, he chose to go to Junior College to play immediately and to gain more exposure. The F/C from Spartanburg, SC will get plenty of exposure this season and have plenty of D1 interest. JucoRecruiting.com talked with Dotson recently and here are the highlights of the Interview. JucoRecruiting.com: You had a great freshman year at Anderson, What made you want to transfer? Dotson: I knew I would have great opportunities that could help me grow as a player and person, as well as help me in the future. Dotson: I heard from a lot of D1 schools but did not want to sit out for a year or rush when deciding on a new NCAA school. JucoRecruiting.com: What made you pick the College of Central Florida? Dotson: The coaching staff is great, they have community that really supports the basketball team, and it felt like it was great school where I could get better on the court. JucoRecruiting.com: What are you looking forward to the most about this upcoming season? Dotson: Expanding my range. I want to be able to shoot more midrange jumpshots next year so the defense would have to respect me more when I face up. I feel like that would help my overall game a lot. JucoRecruiting.com: What’s the biggest strength of your game? Dotson: Scoring with my back to the basket is my biggest strength. I have multiple moves that I can go to in the post and confident around the basket. I also do a good job of rebounding the basket on both ends. JucoRecruiting.com: What are you going to be looking for in a D1 school? Dotson: A coaching staff I trust, good academics, and somewhere I’ll be comfortable. Basically, wherever it feels like just the right fit for me.